Our specialized engineer assured to provide you quick & proper service with care.Low Estimates fee on projectors and economical rates are the incentives for you. Fast services & repairs done by using the latest, advanced technology. ( All type of Projector). With huge clientele assistance and industrial understanding, we are engaged in offering LCD Projector Maintenance Service. Rendered beneath the supervision of highly able executives, these are largely commended all over the country. Moreover, our ability to alter them as per our patrons’ demands makes these highly well-liked. Hitech Enterprises are Authorised Dealers for Epson Range of LCD projectors In India Mumbai. We Provide Video solutuions home entertainment and office solutions. Brand/Model: Epson, Hitachi, Infocus, Optoma, Sharp, Panasonic, Dell, Viewsonic etc. We do all types of Projectors Installation, Projectors Fixing in Bangalore, Karnataka, India. 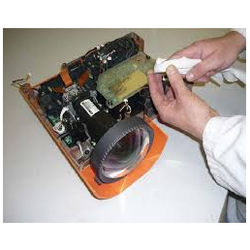 Captivating the skills of our professionals, we are involved in rendering LED Projector Repairing Service. Owing to our rich industrial understanding and expertise, we are intricate in providing Projector Repairing Service to our patrons. These services are delivered under the leadership and observance of the accomplished professionals and competent workers of the industry. Having affluent knowledge and understanding of the realm, we are providing Residential Projector AMC Services. These provided services are one of the most preferential selections of clients due to our cost promptness and reliability. Following the detailed necessities and choices of clients, we also provide these services in altered stipulations.